Vaccinations; are your choice, make an informed one. » Infectious Diseases » Not sure the Tetanus Vaccine is all its cracked up to be? As with most vaccines, we have been led to believe that a tetanus shot is a necessity to protect us from a supposedly virulent germ that can lead us to our death. When we carefully consider some of the facts on tetanus reported in the medical literature, we find many contradictions, inconsistencies and even falsities in relation to actual facts on the bacteria that produces the neurotoxin. Spores of the bacteria have been found in vast numbers of wounds without producing any tetanus, then why is it considered such a threat? The tetanus bacterium is ubiquitous. It is found on the surface of the body, in the mouth, in the gastro-intestinal tract, in house dust and clothing. It occurs extensively in cultivated soils. The organism lives as a harmless commensal in the gut of many animals, in addition to humans (rural residents tend to have higher rates of intestinal carriage than city dwellers). In spite of the ubiquity of the so-called cause, the incidence of tetanus is significantly low. It is not the bacterium itself that causes the development of tetanus but the toxins it produces under anaerobic conditions. “Under normal conditions, no disease will occur if spores are introduced into a wound. “It is the compromised host, or traumatised patient, either by surgery or accident, who is most apt to develop tetanus.” (J Foot Surgery Vol 23, No 3 p235). 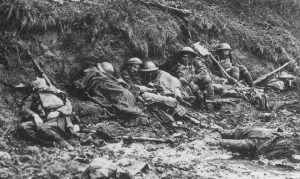 The emergence of tetanus in wounded soldiers during the first months of the First World War (WWI) resulted from combat on richly manured fields in Belgium and Northern France, deep tissue wounds and the intimate contact between the soldier and the soil upon which he fought. In response, routine prophylactic in jections with anti-tetanus serum were given to wounded soldiers, resulting in abrupt fall in tetanus incidence in 1914. The incidence of the disease tended to become even lower as the war went on, even though the serum was not being used. This was probably due to developing natural immunity and earlier surgical treatment, consisting of opening, cleaning, excision and drainage of wounds as early as possible. When, adequate conditions appear, tetanus toxin is known to stimulate the immune system and produce detectable humoral antibodies. Various possibilities resulting from the postulated harboring of tetanus bacilli by the human body and their eventual toxin production were analyzed and related to the human tetanus pathology. The existence of natural immunization was unquestionably demonstrated by presence of protective levels of tetanus antitoxin in the blood of the majority of 59 surveyed subjects considering that none of them had ever received any tetanus toxoid. The geographical distribution of tetanus across the globe generally follows the areas of moist, warm climate and fertile soil — the highest rates occur in the developing world, particularly in countries near the equator. What is the real cause of tetanus? How may it be prevented, and how may a patient recover once tetanus has developed? The real cause of tetanus is not a germ, but dirt and filth. The bacteria are harmless when placed into a surgically clean wound. Tetanus develops when drainage of a wound is checked and dirt is retained in the tissues. The bacilli do not circulate in the blood. They remain at the point of entry and produce toxins. One of these poisons, tetanospasmin, is one of the most dangerous poisons known to man which occasions vigorous activity in the nervous tissues. The other toxin, tetano-lycin, occasions a breakdown of the blood cells. 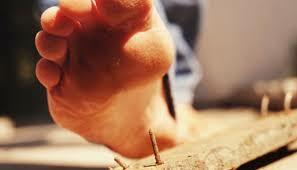 If good drainage is facilitated from the beginning, tetanus will not result from a wound. If tetanus has developed, an incision should be made to afford drainage, removing the foreign matter, and once the wound is drained and cleaned, the bacteria will not be able to elaborate the powerful toxins which are poison in the body. Once the poisoning ceases, the patient will start to recover. The ability to combat, destroy and eliminate the toxins will depend on the health and vigour of the patient. The patient suffering from tetanus should be put to bed, permitted to rest, kept warm and fasting should be immediately instituted. They should receive all the salubrious hygienic influences and the fasting should be continued until all symptoms have disappeared. Wounds should never be permitted to become pent-up. Drainage must be afforded, and if this is done, there is no danger. 4) Generalised tetanus (most common sort about 80%) The symptoms start at the head and work down. Reflex spasms normally occur within 24 – 72 hours, known as the “onset time”. First the person will find it hard to open their mouth; will have a stiff neck and have difficulty swallowing. The development of tetanus by a deep puncture injury is known not to induce any subsequent immunity, which then raises the serious question — how is a vaccine able to produce any long-term immunity? Proper and natural immunity is achieved by the ingestion of tetanus spores through natural entry, stimulating the immune system at all levels in an appropriate way. Critics of vaccination often highlight the fact that injecting foreign antigen into the body by-passes a branch of the immune system leading to a compromised host. Dr Viera Scheibner, a researcher on the ineffectiveness and dangers of vaccination, points out that any injection is a deep-puncture wound, so that is why contracting tetanus through a wound does not produce any long-term proper immunity because of the similar action to a vaccination, i.e. the by-passing of our multi-levelled immune system due to unnatural entry. The following is taken from the Medical Press, Nov 3, 1948. “The not infrequent failure of tetanus anti-toxin prophylactically is indicated by the fact that deaths from tetanus occur in 7% of civilian cases and 50% of military cases, in spite of its use.” From the Medical History of the Second World War, Medicine and Pathology, we note, “It is disappointing to find that the case mortality is the same as in 1914-18. There is still no convincing evidence that anti-tetanic serum possesses curative value.” Many more such statements from strictly “orthodox” sources could be quoted to consolidate our claim that the serum is incapable of affording any protection against tetanus. However, we must now turn to another important aspect concerning the employment of the serum. They refuse to blame the drugs, vaccine and sera for the “reactions” which follow their administration, but assert that the patient was “sensitive”. All this means is that the drug was not to blame. The blame was the patient’s. He or she was “sensitive”. To a greater or lesser degree, we are all sensitive to poisons, that is, when poisons are taken into the body through any channel, an attempt is made to resist these poisons, to expel them or to neutralise them, to get rid of them, to destroy them. In the process of neutralising, expelling and resisting the poisons acute symptoms are the actions of the body, not the drug or serum, actions of the body defending itself against the poison. The vaccine is made from the tetanus toxoid inactivated withformaldehyde. To produce the toxoid the bacterium is cultured in liquid medium in large-capacity fermenters. The medium consists of digestive enzymes of milk protein, allegedly free of contaminants, which is harvested by filtration, purified and detoxified. The vaccine also contains aluminium hydroxide or phosphate, which acts as an adjuvant (any substance used in conjunction with another to enhance its activity), and thimerorsal, a mercury-containing compound, is found in the ingredients of some of the DTaP formulations which is claimed to prevent bacterial contaminant overgrowth. According to medical literature, tetanus toxoid is one of the most potent vaccinations used routinely in children with protective levels being obtained with schedules that start in the newborn period. Apparently in contrast to the diphtheria toxoid, which is clearly impeded in the presence of passively transferred maternal anti-toxin, the tetanus toxoid has been considered to be minimally inhibited by maternal antitoxin. However, interestingly enough, studies in US have shown that infants have high levels of circulating tetanus antitoxin, well above the protective level, at 2 months of age before beginning vaccination schedules. (Barkin RM et al. DTP reactions and serologic response with a reduced dose schedule, J Pediatr 105: 189-94, 1984. — Barkin RM et al Pediatric diphtheria and tetanus toxoids vaccine. J Pediatr 106: 779-81, 1985). Griffin MR, et al, “Risk of seizures and encephalopathy after immunization with the diphtheria-tetanus-pertussis vaccine,” JAMA 1990 Mar 23 30;263(12):1641-1645. Blumberg DA, “Severe reactions associated with diphtheria-tetanus-pertussis vaccine: detailed study of children with seizures, hypotonic-hypo-responsive episodes, high fevers, and persistent crying.”Pediatrics 1993 Jun; 91(6):1158-1165. Vaccinations and Convulsions Citations. Burmistrova AL, “[Change in the non-specific resistance of the body to influenza and acute respiratory diseases following immunization diphtheria-tetanus vaccine],” Zh Mikrobiol Epidemiol Immunobiol 1976; (3):89-91. Pantazopoulos, PE, “Perceptive Deafness Following Prophylactic use of Tetanus antitoxin”, Laryngoscope, Dec 1965, 75:1832-1836. Tagged Tetanus, vaccine, world war one. Bookmark the permalink.